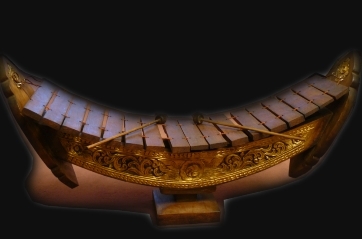 The "pa'tala" xylophone is a large wooden xylophone which we find under a slightly different appearance and different names in Thailand ("ranaad") and Cambodia ("roneat"). It consists of 24 bamboo plates placed above a resonating box, starting with the lowest pitch on the players left side and the hightest picth on the players right side. The plates get beaten by two mallets, actually tuned in a diatonic scale and ranging over three octaves. Normally the xylophone replaces the part of the ancient harp in the duet during performances in chamber music, but modern performance also knows a combination of both instruments, and even ensembles with two or more xylophones.